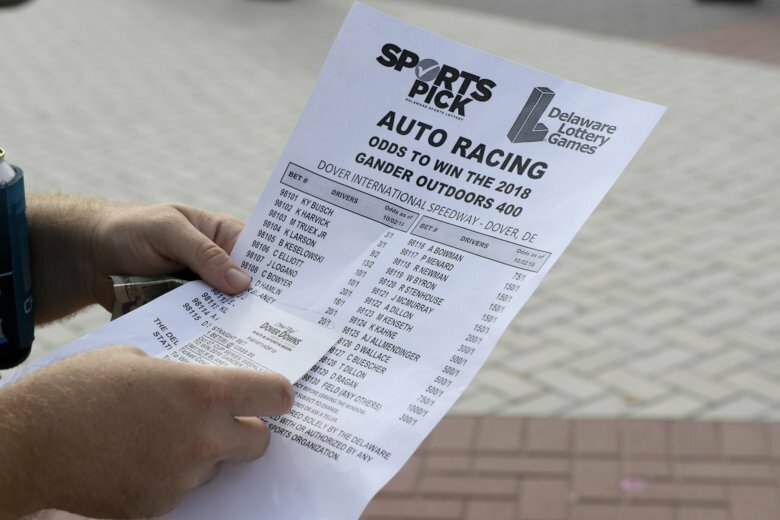 Dover International Speedway opened its on-site betting kiosk this weekend and became the only track that allowed sports gambling on its property. DOVER, Del. (AP) — NASCAR president Steve Phelps said the series is set to implement guidelines in the rulebook on sports betting in 2019. Kyle Busch and Kevin Harvick, who started 1-2 in Sunday’s NASCAR Cup race, have 3-1 odds to win. Phelps, recently promoted to president, said some of the language in the 2019 rulebook could include rules prohibiting drivers and team members from betting on NASCAR. Fans and bettors lined up at the kiosk hours before the race started to wager on more than just the winner of Sunday’s race. Prop bets were offered on everything from the number of drivers on the lead lap at the finish (12½) to most laps led by any driver (188½) to total cautions (7½) over the 400-mile race. At Dover Downs and Dover International Speedway, single-game and championship wagering on professional baseball, football, hockey, basketball, soccer, golf and auto racing are now offered, with betting lines supplied by William Hill. “From a sponsorship standpoint, I think sponsorship will definitely … gravitate to NASCAR as most sponsors do because of the return on the investment they can get because of the visibility that it has,” Phelps said.